Our research interests center on the molecular mechanisms by which the enteric pathogens Salmonella spp. and Campylobacter spp. interact with their host. Together, Salmonella spp. and Campylobacter spp. are responsible for the vast majority of food-borne illnesses in the United States and the rest of the world. Although most often these bacteria cause self-limiting gastroenteritis, they can also cause life-threatening disease such as typhoid fever. To study these bacterial pathogens, we take a multidisciplinary approach including bacterial genetics, cell biology, immunology, and structural biology to define the functional and, when possible, the atomic interface between these pathogens and the host. An essential feature of the pathogenicity of Salmonella is their ability to engage host cells in two-way biochemical interactions. Central to these interactions are two type III secretion systems (T3SS) encoded within the pathogenicity islands 1 (SPI-1) and 2 (SPI-2). 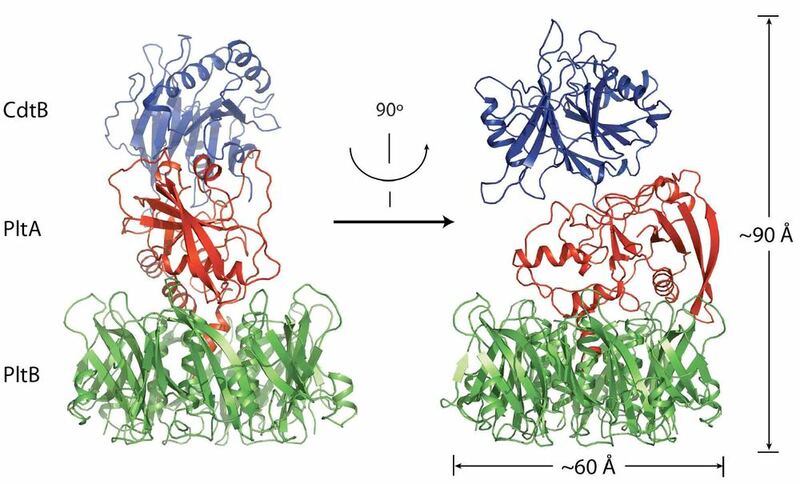 These bacterial nanomachines have evolved to delivery bacterial proteins to host cells to modulate cellular functions. Our laboratory is interested in characterizing the structure and function of T3SSs as well as the activities of the bacterial “effector proteins” they deliver to host target cells. We are particularly interested in defining the structure, function, and assembly pathway of the needle complex (Fig. 1), a supramolecular structure formed by several components of the T3SS. We are also interested in understanding how this nanomachine recognizes its substrates in the bacterial cytoplasm and how it delivers them to target host cells. The two T3SSs encoded by Salmonella deliver more than 50 bacterial effector proteins at different times during infection. Initially, a subset of these effectors (delivered by the SPI-1 T3SS) mediate Salmonella entry into eukaryotic cells by modulating the function of several Rho-family GTPase, remodeling of the actin cytoskeleton and triggering bacterial uptake (Fig. 2). This initial interaction also leads to a profound transcriptional reprogramming of the infected cell. Later in the infection process, additional effectors delivered by both T3SSs modulate vesicle traffic and help Salmonella avoid innate immune defense responses. These effectors exhibit a variety of biochemical activities such as phosphoinositide phosphatase, protease, E3 ubiquitin ligase, etc. These effectors exert their function by mimicking activities and molecules present within the host cell itself. We are interested in defining the biochemical activities of the different effector proteins, identifying the cellular targets for these activities, and unraveling their specific contribution to Salmonella pathogenesis. Unlike most Salmonella enterica serovars, which cause self limiting gastroenteritis (i. e. “food poisoning”) and can infect a broad range of hosts, Salmonella enterica serovar Typhi (S. Typhi), is a unique human pathogen that causes “typhoid fever”, a life threatening systemic disease that kills more than 200,000 people every year. We are interested in defining the unique features that make this pathogen so lethal. One of the specific areas of emphasis is the study of “typhoid toxin”, a unique A2B5 toxin exclusively present in S. Typhi and the related serovar Paratyphi., which can also cause typhoid fever (Fig. 3). S. Typhi produces typhoid toxin only within mammalian cells. After its production and secretion from the bacteria, the toxin is transported to the extracellular environment by a unique mechanism that involves vesicle carrier intermediate. Systemic administration of the toxin to experimental animals can, by itself, reproduce many of the typhoid fever symptoms. We are interested in defining the mechanisms by which the toxin is produced at the appropriate place, transported out of the bacteria and out of the infected cells, as well as the mechanisms by which it causes typhoid fever. We are also interested in defining in molecular details the mechanisms that restrict S. Typhi replication in non-permissive hosts with the ultimate goal of defining novel mechanisms of pathogen control by the innate immune system. Campylobacter jejuni can colonize the intestinal track of many animals without causing disease. Although its mechanisms of pathogenesis are incompletely understood, it is known that motility as well as its ability to enter into non-phagocytic cells (Fig. 4) play an important role in colonization and pathogenesis. We are interested in defining the mechanisms by which C. jejuni enters and survive within into intestinal epithelial cells. In addition, we are investigating the mechanisms by which this pathogen can colonize and replicate in different tissues.